The Annual Dinner brings together over 1,000 North Shore Hebrew Academy community members for a celebratory night filled with delicious food, and a beautiful program including musical presentations from our student choirs. 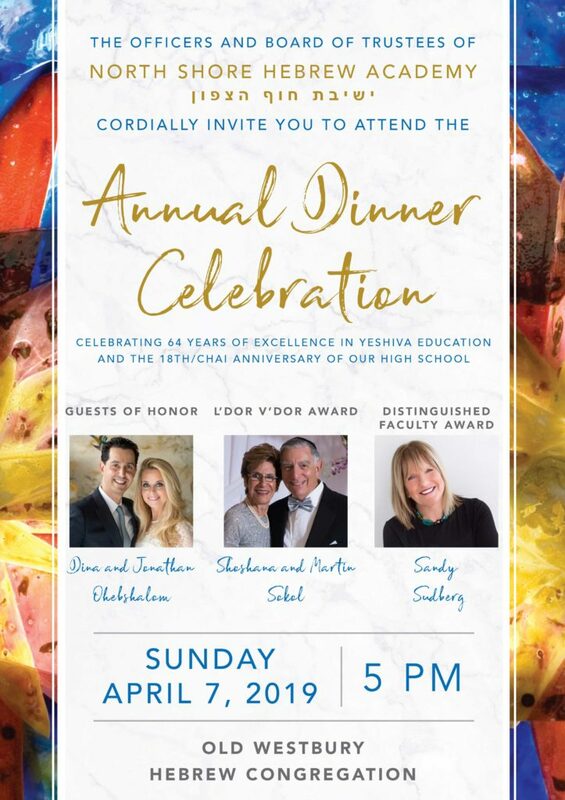 Proceeds from the annual dinner celebration help us provide our students with a top Jewish and general education and diverse co- and extra-curricular programming, as well as give scholarships to our families in need. The annual dinner is the school’s most important fundraiser of the year. Our entire NSHA family comes together to celebrate our progress and accomplishments and looks forward to our future. Funds raised for the dinner help support over 1,100 students enabling them to get the best Judaic and General education possible. As in most private schools and Yeshiva Day Schools, tuition payments although high, cannot cover the cost of a student’s education. We, therefore, must rely on generous philanthropic support and hope that you will contribute generously to help us continue our mission of providing excellence in education to all our students. We rely not only on our parents and grandparents but also on our alumni, alumni parents and especially our community families who benefit by having this institution in its midst. By investing in NSHA, we are perpetuating the next leaders of our Jewish community who will be fully engaged in ‘Torah Umadah’ in the modern world. Please help us, therefore, to continue to provide the myriad of programs and services that make this school so special and of utmost importance now in this difficult economic environment, raise the scholarship funds to help those families in need. For further information, please contact our Executive Director, Arnie Flatow at aflatow@nsha.org or call the Business office at 487-8687 ext. 2. To view the pictures from the red carpet from NSHA’s Annual Dinner 2017 click here.